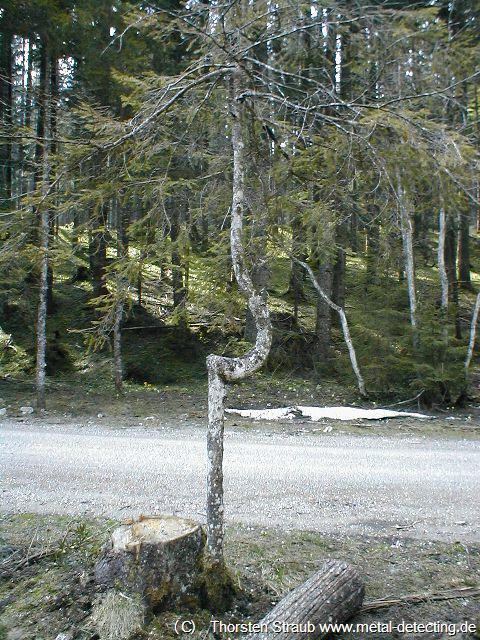 A natural 90 degree angle. 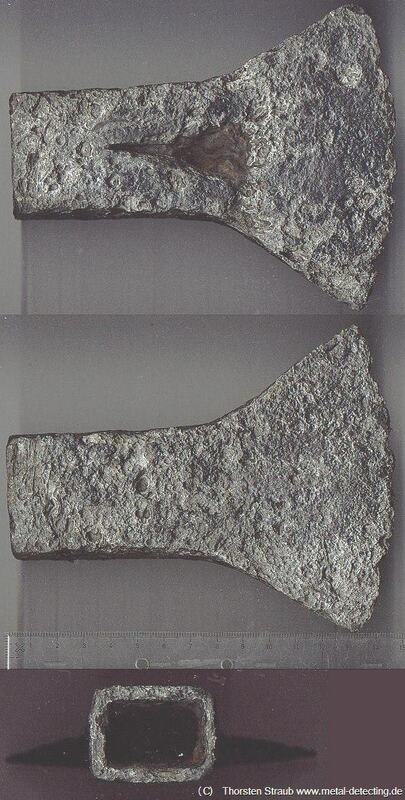 Socket axes are the oldest iron axe type. They were used by the Celts and, to a lesser degree, also in Roman times. Using a wood with a natural 90 degree angle – a so-called “knee wood” – the shaft was inserted perpendicular to the blade rather than parallel as with modern axes. This sort of attachment was easier to fabricate but less reliable. 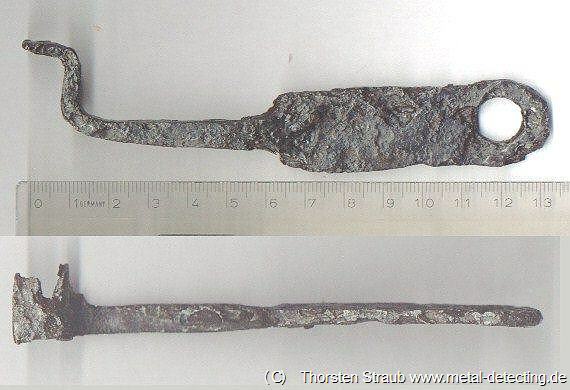 Iron tools are notoriously difficult to date because their form follows the function which has not changed over the centuries or even millenniums. 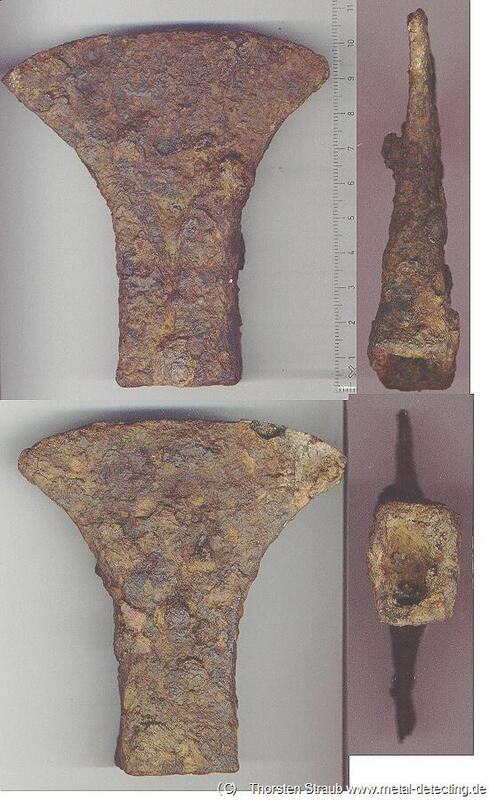 Some Roman hammers look very similar to the models we find in the hardware stores. 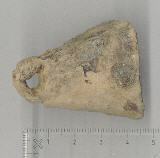 Socket axes, however, can be dated relatively well. With some very rare exceptions they belong to antiquity. Socket axe 10 cm long. Find state. 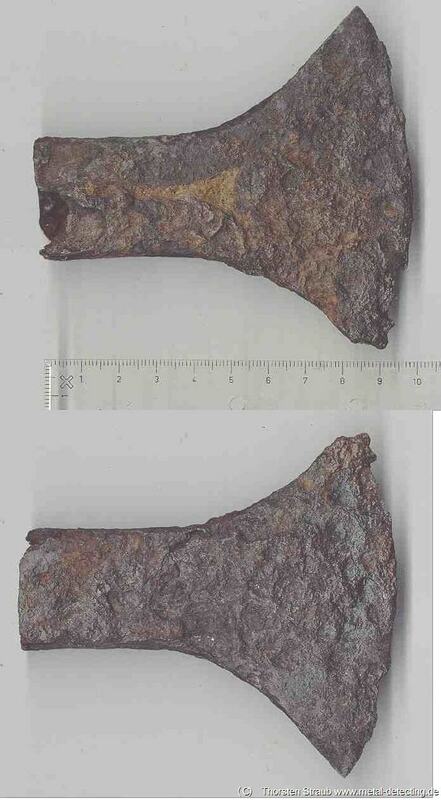 This axe is just some 10 cm long and weighs 262 g. It was used for fine work. According to the find circumstances a Roman background is slightly more probable than a Celtic origin. That would place the axe in the AD 0 – AD 500 time frame. Socket axe. 10 cm long. Cleaned state. Socket axe 15 cm long. Find state. This socket axe is some 15 cm long. 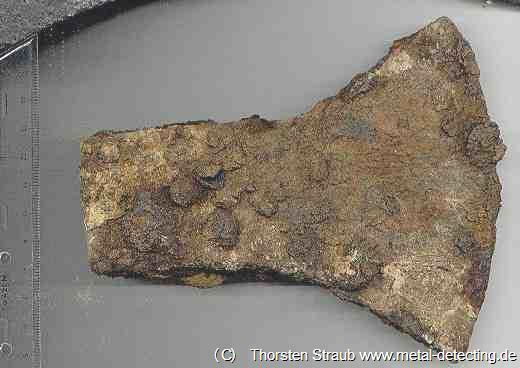 Like with the small axe here a Roman background is more probable than a Celtic origin. Probable date AD 0 to 500. Socket axe 15 cm long. Cleaned state. Weight some 40 grams each. 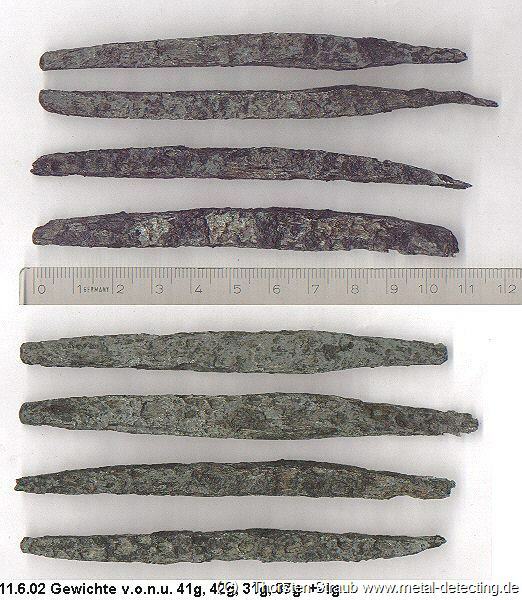 These four iron items are either ingots, files or some tools in an intermediate state. .They originated from antiquity or the early middle ages when iron was precious. 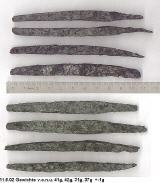 Pointed ends are typical for antique ingots. This form made it easier to check the quality of the iron. Knife AD 0 to 1000. In most cases it is not possible to date a knife on a typological base. Such delicate and slim forms are typical for antique and early medieval types, though. This specimen was found near an antique river crossing. Iron bells, often plated with tin or copper against corrosion, were carried by animals. Especially when the animals were driven into the forest to feed on leaves and acorns. There form changed slightly through the centuries. The pyramid shape with a square opening is typical for Roman bells which were often made from bronze. This item might not look like much but it is interesting in my opinion. Instead of the modern “U”-shaped horse shoes the Romans used the so called hippo sandal. It was basically an oval shaped plate as large as the hoof with several smaller plates attached in a 90 degree angle. These smaller plates held the hoof in place. They had hooks so leather bands could be used to attach the hippo sandal firmly to the hoof. No nails were used so nail holes were not necessary. What you see above is an intermediate form between a hippo sandal and a modern horse shoe. It has no nail holes. Here four small plates were used. Two can still be seen in the top corners, one has been detached during excavation and is shown in the bottom right corner. 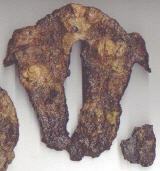 While showing these characteristics of a hippo sandal it clearly shows the U shape of the modern horse shoes. All that remained to be done was to abandon the attached plates and use nail holes instead. And to adapt the iron to the natural shape of the hoof.